Our 128-key ruggedised keyboard touchpad is an excellent peripheral solution for industrial panel PCs utilised in tough applications. Its IP67 sealing rating and stainless steel construction allow the device to last in harsh working conditions. This means that it can be used over extended periods in extreme environments whilst performing optimally. With this, data input is more accurate and coding functions are varied. As a result, bottlenecks in operations are reduced and productivity is highly-improved. Many industries bear harsh working conditions that can damage commercial-grade equipment. Hence, it is essential to install industrial-grade keyboard components to ensure that the device under the presence of extreme temperature, shock, dirt, and moisture intrusion. 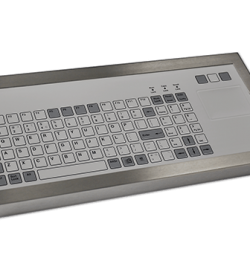 Our 128-key ruggedised keyboard integrated with a touchpad has an IP67 rating plus stainless steel (304) construction. Hence, it is protected from dust and liquid intrusion, with added resistance to corrosion and abrasion. Therefore, it is perfect for tough applications and washdown areas. 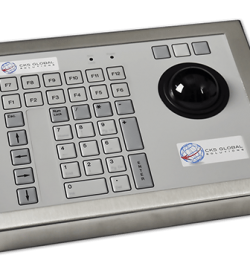 Rugged panel PCs with this type of peripheral ensures that operators are able to conveniently navigate software applications. 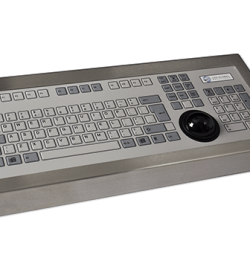 With its integrated touchpad pointing device, it promotes an ergonomic and efficient workflow. It provides more dynamic and streamlined operations. 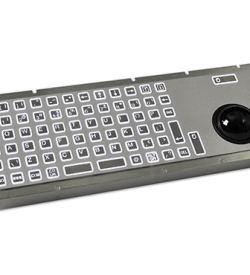 Facilities bearing harsh temperature can definitely take advantage of this 128p keyboard series. Even with harsh temperature, it can continue to perform its functions optimally. Our 128-key series keyboard uses the mechanical switch technology since it is durable and provides better typing experience. With its excellent typing feedback, it reduces data input errors whilst being able to last over extensive usage. Polyester is a strong material that is very resistant to abrasion and chemicals. 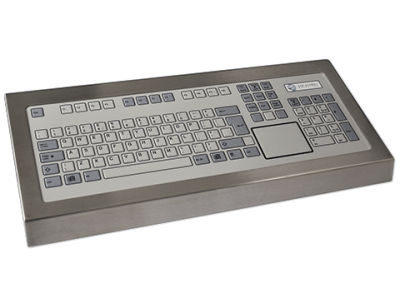 Hence, the 128-key rugged keyboard with touchpad is an ideal peripheral for panel PCs in industrial settings. We understand that industries have different hardware pre-requisites in many operations. Thus, we provide customisation options to build the hardware that is most suitable to your business operation needs. Get started and download a free datasheet about this device. Contact us about this product on our form or call (+44) 01438 747111 for enquiries today.